Buff earthenware covered with a brown slip and with potsherds embedded in the fabric. Covered with a clear glaze. 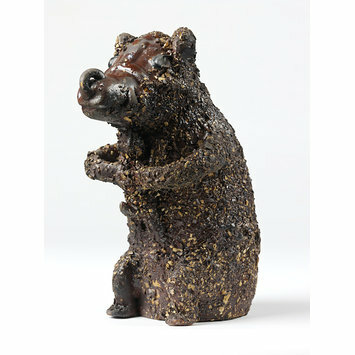 Drinking-vessel in the form of a bear hugging a dog, of buff-coloured earthenware, coated with a brown slip in which are embedded fragments of potsherds, and covered with a yellow glaze. The bear is represented sitting up on its haunches and hugging the dog with its forepaws. It is muzzled and has a ring in its nose. Transferred from the Museum of Practical Geology, Jermyn Street and formerly in the Enoch Wood collection. 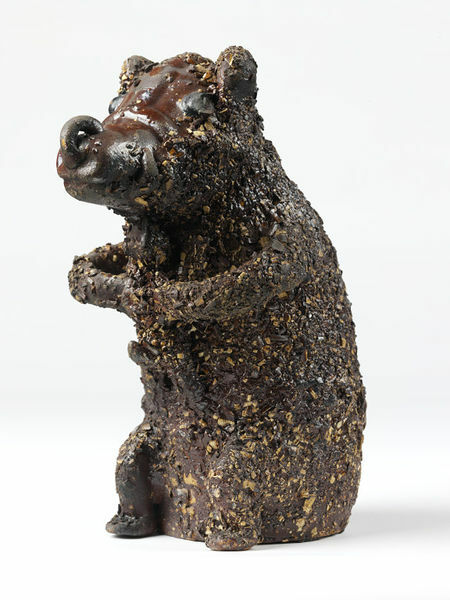 Figure of a bear in buff earthenware coated with a brown slip and with potsherds embedded into the body. English (Staffordshire), about 1730 to 1750.